10°C water at Svalbard. Stop laughing this is catastrophic. Hugh, as a morning off-beach swimmer in Adelaide where it’s presently around 11°, I’m spellbound by your kilometre at -1.7°. All power to you with the Arctic Decade Campaign. The entire human population is suffering massive delusions about the resilience of atmosphere, land, sea and all ecosystems – notably the human ecosystem – to temperature and radiation shock. so attention-catching campaigns marked by human bravery (!) and vitality are sure needed. Im saddened by the state of change our climate is facing. Kudos to you for your work and raising awareness to the damage occurring now. Ten years ago, I stood on the edge of the sea ice at the North Pole staring into the ink-black Arctic Ocean. 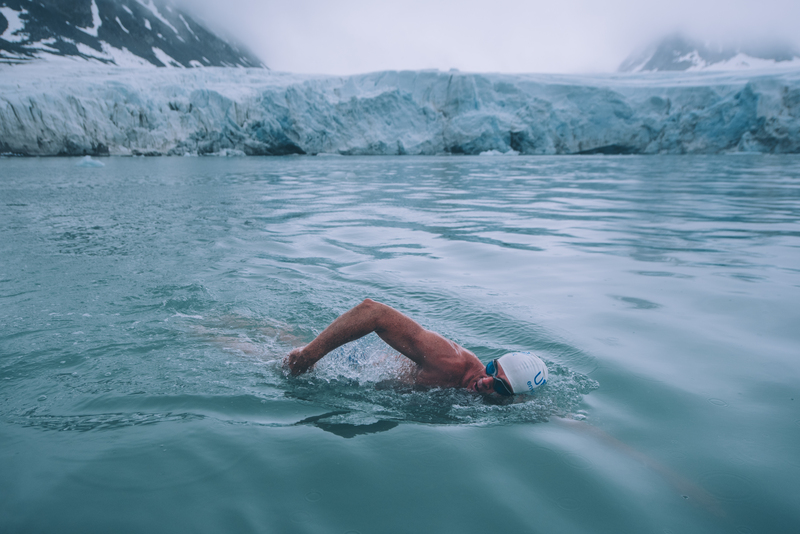 I was attempting to become the first person to complete a long distance swim in minus 1.7°C (29°F) waters. I had no idea whether I would make it to the end of the kilometre, and I was terrified. Fear is the first thing I remember about the swim. The second is the feeling of looking across the ice and seeing patches of open water everywhere. Water, where there should have been sea ice. The fact that there was water at the North Pole in the first place was alarming, and I wanted the world to know about it. Now I’ve returned to the Arctic, once again with a sense of trepidation. I know I’ve changed in the intervening years, but the Arctic has changed even more. Just days into our expedition, two things have shocked me. The first happened during my training swim in Longyearbyen, Svalbard. Last time I swam here, in 2005, the sea temperature was 3°C. This time it was 10°C. This just 1,300km from the North Pole! Our ship is heading north, and yesterday we stopped at Monaco Glacier. I have vivid memories of swimming there, in front of an enormous glacier. It was a stunning sight. But when we arrived in Liefdefjord, I almost didn’t recognise it. As a landmark it was thousands of years old, and now it’s rapidly receding up 2 valleys. Over the last ten years people have often said to me, ‘You must be mad to swim there.’ But I feel like the rest of the world is mad, and I am the sane one. I have seen such big changes taking place in the world around us, but I haven’t seen our global attitude change. Our captain on this voyage is Raymond Martinsen, who, coincidentally, captained the ship that brought me here in 2005. 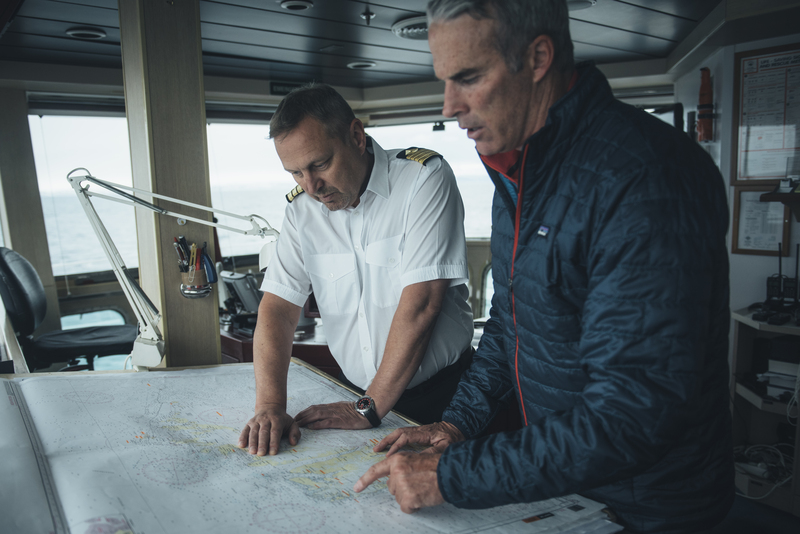 To hear him name the glaciers that have disappeared in his 30 years of sailing is truly terrifying. It supports what scientists have been telling us: during the past two decades average temperatures in the Arctic have risen almost twice as much as they have at lower latitudes across the globe. The result: widespread shrinking of glaciers, sea-ice and snow-covered areas. This not only affects the creatures, great and small, that live here in the Arctic. It goes beyond the narwhals and the bearded seals, the Svalbard reindeer and the Arctic Fox, the puffins and the polar bears, whose natural habitats are being drastically altered. Because what happens here determines all our futures. This is why we’re launching the Arctic Decade Campaign. Starting with a voyage between three of the Arctic nations – Norway, Canada and Russia. And I’ll be meeting people on the ground directly affected by the kinds of change we are seeing, listening to their experiences. What happens where they live affects all of us, wherever we live. What do we need to do in the next ten years to protect the Arctic? First and foremost we need governments, businesses and individuals to urgently reduce the levels of greenhouse gases in the atmosphere. I will also be calling on world leaders to not only implement the Paris Climate Agreement, but to go way beyond it. I am deeply shocked by what I am witnessing. I’ve been swimming amongst ice for 15 years. It’s a substance I know well. I am not a climate scientist, but what I am seeing looks like runaway climate change in the Arctic. This campaign is about finding and implementing urgent solutions. My hope is that when we look back on this Arctic Decade in years to come, we will celebrate it as a time in which we brought our beautiful planet, and this amazing region, back from the brink.